Let others ooh and ahh over the monuments at Angkor Wat; plenty of folks have brought home amazing photos and insights of these temples. I want to sing the praises of a local restaurant not featured in Tripadvisor or Lonely Planet in a humble neighborhood just minutes away from the night market and Pub Alley but worlds away in terms of style, intent and customers. 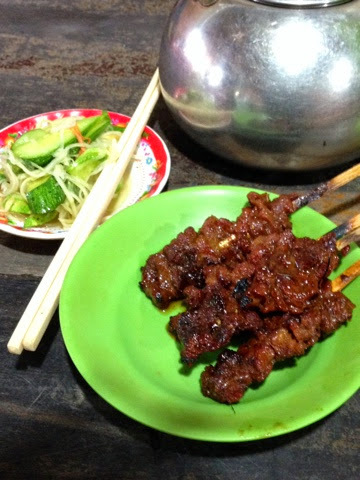 Near the Wat Damnak was a small stall with a charcoal grill out front, a child's artwork on the walls, small plastic chairs, low tables and the best lemongrass marinated grilled beef you can imagine, served with a side of tart salad papaya salad and cool green tea. This is one of the recipes I plan on developing when I get home, so watch for more info and directions. Meanwhile the memory of this meal is one of my favorite souvenirs.